Enjoying the green space, sheltered by furniture built by landscape architects, 2014. 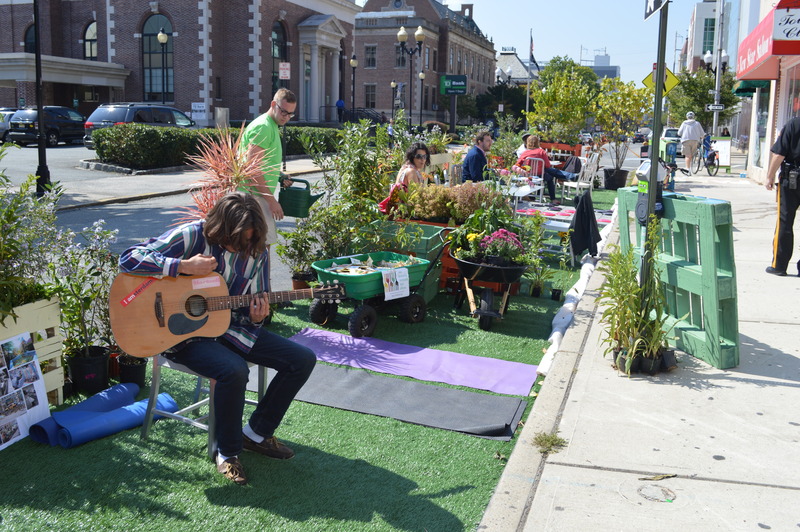 For the fifth consecutive year, Park(ing) Day returns to New Brunswick on Friday, September 18, promising to be the best year yet! 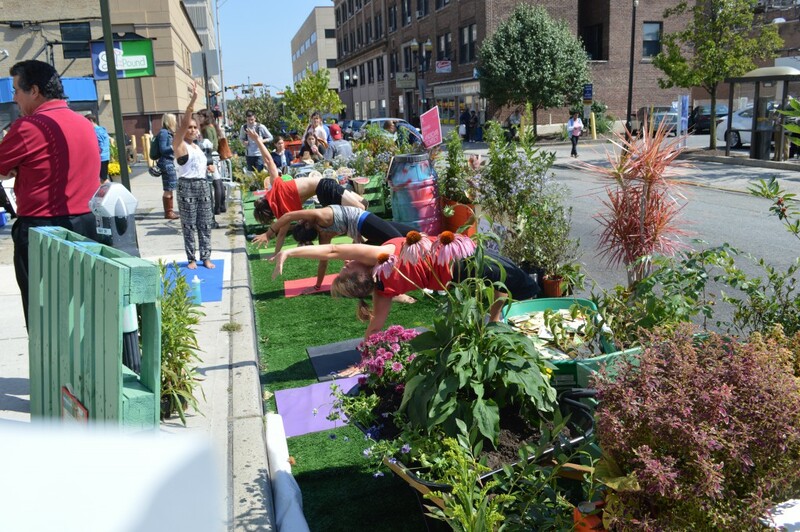 Park(ing) Day involves transforming street parking spaces into green, usable public space for a day, to demonstrate the potential for permanent transformations of street space. These “parklets” are open to members of the public to enjoy and socialize. For the first time ever, Park(ing) Day in New Brunswick will feature three separate parklet installations, extending the reach of the event into the community, and demonstrating different ways parklets can enhance urban space. Park(ing) Day is an international event that began in 2005 in San Francisco. It is now a global movement where all organization and implementation is handled locally by volunteers, unified only by the same goal to enhance public spaces. Worldwide, Park(ing) Day is celebrated this year on Friday, September 18. 49 Bayard Street: “Café Park” will be located closest to the location used for the previous three years. This visible location will provide café-style seating and volunteers to help explain the concepts of Park(ing) Day, Complete Streets, and street safety. Visitors will be directed to the other two parklets and given a schedule of the day’s activities and entertainment at this location. 27 Bayard Street: “Wellness Park,” located just a block away, will be the home for yoga and local entertainment performances. Located in front of The Garden of Healing, this parklet will feature a canvas for spontaneous artwork, a “selfie” backdrop, a drum-making demo, and free instruction on yoga and capoeira. An educational water feature will demonstrate the principles of stormwater runoff. Comstock Street at Livingston Avenue: “Chef Elijah’s Park” will be located just outside the headquarters of Elijah’s Promise. The theme here will be community work and healthy eating. Individuals training at the Promise Culinary School will use the parklet to give live demonstrations on food preparation. They have reached out to Redshaw Elementary School – just across the street – to have children come by to learn about parklets, nutrition, and food preparation. Parking Day came to New Brunswick in 2011, when Walk Bloustein Bike Bloustein (WB3), a student club at the Rutgers University Bloustein School of Planning, attempted to erect a small green space on Easton Avenue to celebrate the day. Unfortunately, that event was terminated by local police who required a permit. Since then, organizers have applied for permits, and Parking Day has been officially sanctioned and celebrated by the city. Last year, New Brunswick Mayor Jim Cahill talked with Heather Fenyk, Director of the Lower Raritan Watershed Partnership over a morning coffee at the parklet. We hope he will join us again this year to celebrate both Parking Day and the expansion of nearby local businesses. Nick Tufaro built a chessboard for the 2014 edition. Planning and implementation of Parking Day has grown to include numerous local organizations and individuals, which has allowed the event to grow in size every year. The primary leaders continue to be WB3 and the Rutgers University Landscape Architecture Club, a student chapter of the American Society of Landscape Architects. Nick Tufaro, New Jersey Chapter Trustee for the American Society of Landscape Architects (NJASLA), has used his expertise and connections within the landscape architecture community to elevate the quality and visibility of Parking Day. He has mobilized student members of the chapter to apply their talent in designing public green spaces to build beautiful and functional spaces. He has also leveraged access to local nurseries and landscapers who loan materials for the event. For the most recent editions, members of the NJASLA Student Chapter/Rutgers Landscape Architecture Club, have devoted entire weekends to build temporary walls and seating features that can be quickly installed in the morning and removed without leaving a trace in the evening. Lower Raritan Watershed Partnership, which seeks to conserve and restore the Lower Raritan Watershed, is partnering with CoLaB Arts to create a sculpture from “found items” from river clean-ups. They will also collaborate in creating planters using tires pulled from the river – especially appropriate for a street-parking spot. Elijah’s Promise, founded as a soup kitchen, has since expanded their work into offering a training program called Promise Culinary School. In this program, they train community members to work in the food service industry. For Park(ing) Day, they will provide live food preparation demonstrations with samples at the parklet located outside their front door. The New Brunswick Community Food Alliance and local community gardens are working to make New Brunswick a place where food is affordable, healthy, and easy to access. For Park(ing) Day, they will provide wheelbarrows filled with free seed packets at each site for people to take home to grow their own vegetables and flowers. Bunch A Balloons of 49 Bayard Street is supporting a parklet for the first time with Legal Grounds Café of 55 Bayard Street, a longtime participant. The owner will help draw attention to the installation by donating colorful balloon archways and a balloon roof for shade structures. 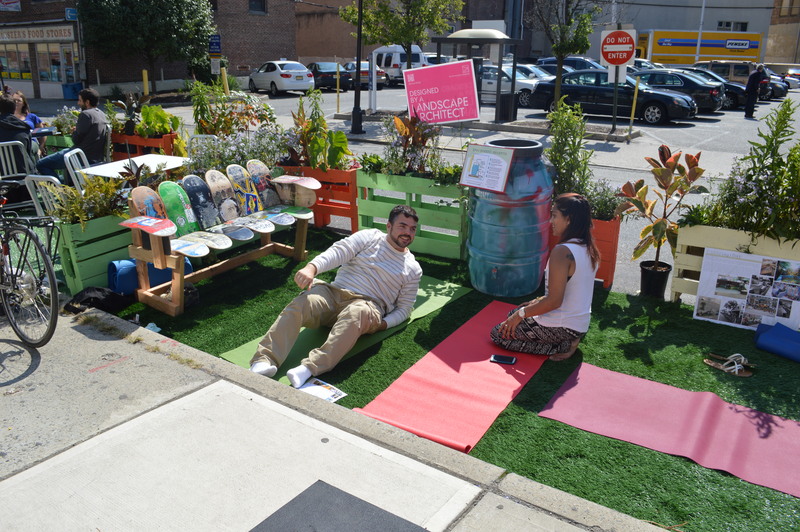 The Garden of Healing, Yoga, & Wellness Center, at 27 Bayard Street, became involved with Park(ing) Day last year. Owner Carla Haynes coordinates free yoga demonstrations and musical performances in a daylong program for the spaces. She also provides crucial connections with local business community. Will Atwater, a professional videographer, will document both the preparations and implementation for Park(ing) Day. In 2014, his Park(ing) Day video “went viral”, an international social media success. This year’s video will be used to demonstrate the value of parklets in New Brunswick and beyond. An early design for one of this year’s parklets. Organizers are taking a risk in creating three separate parklets this year, but with so many eager volunteers, the 2015 edition is shaping up to be the most successful yet. Park(ing) Day officially kicks off at 10:00 a.m. on Friday, September 18. The public is invited to stop by the three locations throughout the day until 5:00 p.m. to enjoy the free entertainment, learn about urban spaces, and just relax outside before summer ends. 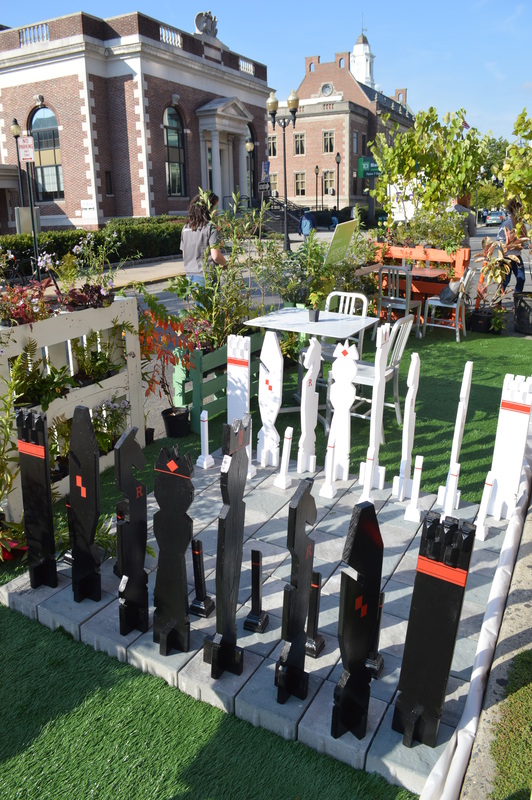 If you’re interested in learning more about Park(ing) Day, please check out this article on the 2013 edition in New Brunswick. Posted on September 8, 2015 January 20, 2017 by njwalksnbikesPosted in Community Engagement, Parks, Recreation and GreenwaysTagged american society of landscape architects, New Brunswick, Parking day, rutgers landscape architecture club, walk bloustein bike bloustein.